By now you’ve seen GID15; wonder what it means? 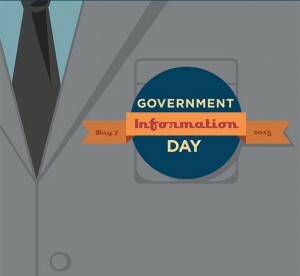 GID15 is Government Information Day 2015! Carol Rogers, Indiana Business Research Center: A Working Update on Indiana Data. For more information and to register for GID15, please visit the Government Information Day page. We look forward to seeing you! This blog post was written by Kimberly Brown-Harden, Federal Documents Coordinator, Indiana State Library. For more information, contact the Reference & Government Services desk at 317-232-3678, or go to www.library.in.gov. This entry was posted in For Librarians, Reference & Government and tagged #GID15, Davita Vance-Cooks, Government Information Day, Government Publishing Office, Indiana, Indiana State Library, Indiana University, Indianapolis, Library by indianastatelibrary. Bookmark the permalink.